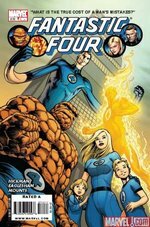 On September 21, 2010 the Heroes Aren’t Hard to Find Discussion Group talked Fantastic Four Volume 1 collecting issues 570-574. As an added bonus, author of the run, Jonathan Hickman, himself, drops in to join the discussion. That, plus the moderating genius of Andy Mansell makes the excitement level of this event equivalent to a hurricane wrapped in a tornado.